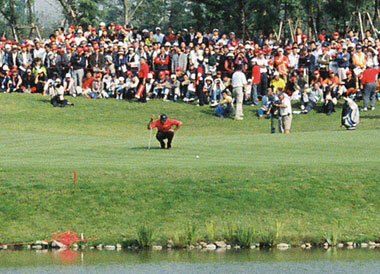 We witnessed Tiger in the flesh on Sunday at the HSBC Champions tournament at Sheshan Golf Club here in Shanghai. Here you can see him lining up a putt on the 9th, but when I get my next role developed I expect to have a much better shot of him, which I shot up close after he finished his round. It was really a great event. I, who love golf, was bound to have a good time – no surprises there. But many doubted that my lady would be amused at walking around a vast expanse of land for hours on end watching large men hit little balls at faraway targets. The doubters were wrong; she loved every minute. In fact, this was not her first golf tournament. She accompanied me to the 2004 China Open, also in Shanghai, which gave tickets away for free because Chinese people don’t care about golf Tiger wasn’t there. The biggest name at that event was Thomas Bjorn. But this one was huge. I guess there were over 10,000 people there Sunday. And media were all over the place, as were the corporate sponsors. They had an area set up to play games, and I took shots of her playing mini-golf and getting a free ten-minute lesson. The Chinese love Tiger, and some will say it is because they love a winner. All Chinese F1 fans (that I have met) love Michael Schumacher. All basketball fans love Jordan. And all golf fans love Tiger. People become golf fans because they love Tiger. This is not limited to the Chinese at all; it’s a worldwide phenomenon. I have to admit, the guy is MAGNETIC. Just knowing that I was on the same course as him made me feel electric. When I saw him up close, I felt magic. I can’t describe it. Star power, I guess. I got tickets by playing up the media angle, getting a pass to the media tent and a free lunch. That meant that I got to go to the press conference the Tuesday before the tournament started, at which Tiger made an appearance and answered some questions. I tried to ask him if he would ever design a golf course in China (he recently announced the formation of a design company), but the moderator never called on me and eventually a Chinese journalist asked my question. Tiger answered in his usual loquacious, noncommital, and media-savvy way. On Friday he shot the course record, 64, but in the end he didn’t have enough to win, and came in second – the same as last year. And again, a relative unknown won. This year the champ was Yang Yung-eun of Korea, who beat out third-round leader Retief Goosen in the final holes. Cool finish.